In 1948 two Olympic Torches were made by E.M.I Ltd, designed by Ralph Lavers and donated to the Organising Committee of the XIV Olympic Games. Plans are under way for a 2012 Torch Relay spanning the UK. But what happened last time London staged one? It was no 70-day extravaganza and it involved nothing like the 8,000 torchbearers that will carry the Olympic flame around the UK in 2012. 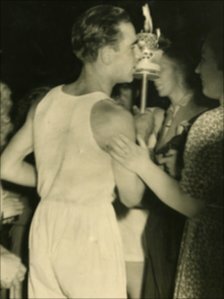 But the London 1948 Olympic Torch Relay was greeted with wild rejoicing and a mobbing of the torchbearer, even when he, (and they were all ‘he’) ran on by in the dead of night. Ahead of London’s “Austerity Games”, organisers wanted to stage a relay to “capture the imagination of the public and the spirit of the Olympic torch”. Torch was designed by EMI Ltd. The organising committee, led by Lord Burghley, decided to continue the pre-war tradition started by the Nazi regime at the 1936 Berlin Games to set up only the second torch relay of the modern Olympic Games. It had to be delivered on a post-war budget. Britain was struggling in 1948, rationing would be in place for another six years. “Things were pretty grim,”” says Terry Charman, senior historian at the Imperial War Museum. “Although the war had finished in 1945, Britain was still a very impoverished country in 1948. “A lot of wartime conditions were still in place. Not just food rationing but clothes rationing, everything was in short supply. “There were few cars, the petrol allowance was so small. It was a very grey time and a very bleak winter in 1947 set things back. Britain could barely afford to stage the Games, let alone a torch relay, so its size, scope and the torch itself had to be affordable. 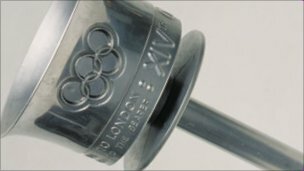 Hold a 1948 Olympic torch and its simplicity is revealed – fairly hefty, a plain stem topped with a wide cup that held the burner. Forties-style capital letters spell out “With thanks to the bearer” and the Olympic rings are punched out on the bowl. Its designer Ralph Lavers was tasked to create something “inexpensive and easy to make,” but still “of pleasing appearance and a good example of British craftmanship”. The torches were made of aluminium, which was relatively cheap, and ran on solid fuel tablets, except the one for the final leg at the opening ceremony inside Wembley’s Empire Stadium. It was stainless steel and housed a magnesium-fuelled flame designed to be easily visible by the watching crowds and cameras. 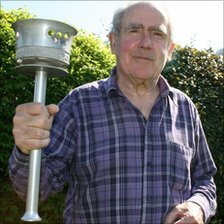 On the A25, club runner Frank Verge, then 22, was waiting in the darkness to carry the torch on a two mile stretch between the Kent villages of Platt and Ightham. His torch-bearing place was hard fought – he had taken on his older brother John in their club’s eight mile run and ignored his shouts of “ease up, you’ll burn out” as he broke away to win. “They do say everybody has 15 minutes of fame in their life and I think that was mine,” he says of the 4.03am to 4.17am slot. “We had just gone through six years of war and I think the Olympic Games stood for more because it was a different kind of life – everyone was happy. 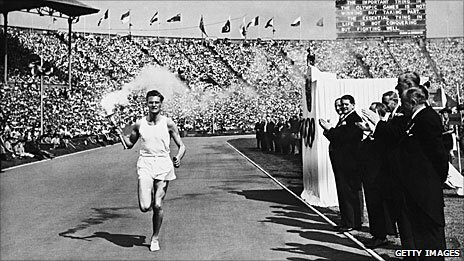 He handed over to the last runner in the stadium, relatively unknown quarter-miler John Mark, whose athletic good looks were controversially chosen over the favourite-but-bespectacled miler Sydney Wooderson or the widely-expected Duke of Edinburgh. This entry was posted in Uncategorized and tagged 1948, bbc, EMI, olympic games, olympic torch, ralph lavers, syndney wooderson by Nipper. Bookmark the permalink.